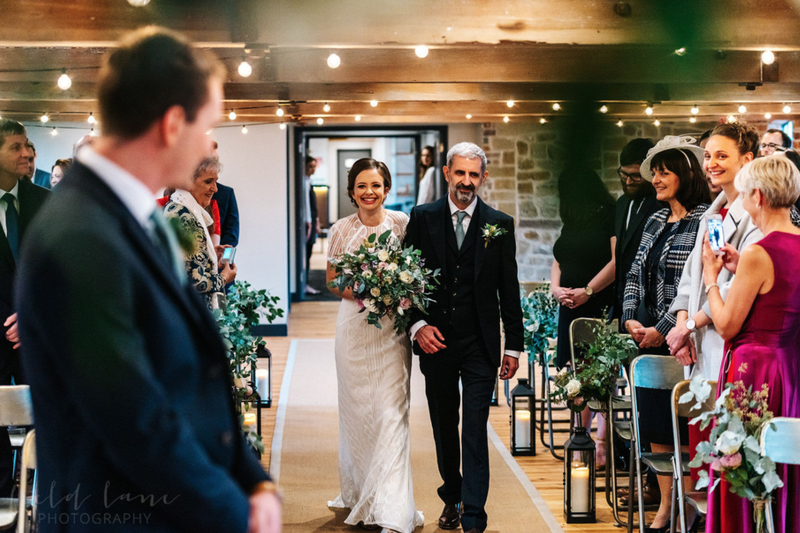 If you choose to have your ceremony at our unique wedding venue in Derbyshire you can make use of our renovated ceremony room on the top floor. This beautiful space offers the couple the opportunity to have their whole wedding day under one roof. Our large wedding venue in Derbyshire is newly licensed and our ceremony room allows seating for up to 150 guests. The room oozes historical charm and offers the perfect option for those couples not wishing to get married in church. The use of this room is included in the price of hiring our open plan wedding venue, and details regarding booking a registrar can be found on our FAQ page. Alternatively, couples can personalise their ceremony by using a celebrant. Couples wishing to marry in one of the lovely local churches nearby can do so before bringing all their guests back to Haarlem Mill to enjoy their reception at our industrial style wedding venue. To add even more to our stunning Derbyshire wedding venue, we have an elegantly designed and carefully furnished bridal suite. This private space is available on the day of the wedding for the bridal party from 10am and is situated next door to the upper lounge and ceremony room. This room allows the bride and her party can enjoy a relaxing morning getting ready for the arrival of guests and her husband to be in a private area within our beautiful wedding venue in Wirksworth. This beautiful authentic beamed red brick room within our Derbyshire mill wedding venue can seat up to 150 people comfortably and with clever table lay out a minimum number of 60 guests can also dine without losing the sense of occasion and atmosphere. We offer gorgeous, long wooden trestle tables with an informal yet stylish feel, accompanied by beautiful vintage school chairs. Following your sumptuous wedding breakfast created by our in-house catering team, your guests will be invited to take their coffee in our stylish bar and lounge, whilst the team turn the banquet room around to create a wonderful party room for the evenings entertainment. A relaxed upstairs bar is available for larger weddings and allows guests who wish to have a more quiet evening to find some space away from the noise of the dance floor. This second bar area in our Derbyshire wedding venue can also be closed off, should you want to keep the whole party on one floor. The Mill will be available until midnight, where guests will be expected to vacate the premises for transportation to their local accommodation. Food that screams quality, passion and love. We pride ourselves in producing tailored menus that combine the couples tastes, the local area and our love of cooking. We are passionate about the in-house catering at our Derbyshire wedding venue wowing both you and your guests on your big day. Having worked in the wedding industry for many years, we understand just how important the wedding breakfast is to you and on your big day, we always deliver a meal packed with flavour, thought and served with a smile. Our unique Derbyshire wedding venue has its very own purpose-built kitchen, which means we can offer you a choice of menus to fit in with your taste, dietary requirement and budget. Whether you want a simple yet hearty menu or a fine dining experience, our team will make sure it's the perfect fit for your day. With the venue owners background in wedding catering, you can be assured that whatever your requirements for your catering, it will be a real talking point. Our menus reflect the seasons and the wonderful produce grown, reared and produced locally. In particular, we are especially proud of the quality of the meat we use, having a father and brother team of butchers who not only rear their own lamb and beef, but process and butcher it with care and passion. We are also delighted to be a Derbyshire wedding venue that offers a great selection of vegetarian and vegan menu options. Our bars will be open during the course of the wedding day to provide a wide and fashionable selection of drinks to your guests. Our industrial style wedding venue stocks everything from locally brewed craft ale to carefully selected wines, spirits, bottled lagers and champagne. The range of whiskies, gins and other spirits which are proving fashionable will be particularly varied, something we hear is a unique feature in a wedding venue. Our perfectly crafted menus are available, as well as expert advice on choosing wine carefully matched to your wedding breakfast. Just as important is the selection of non alcoholic drinks for many guests who wish to abstain.